Invariably, when asked what we do for a living, we cautiously share that we are licensed private investigators. The reaction is usually one of great curiosity and awe. Normally, we feel obliged to "burst the bubble" and tell people that "it's not like television." No, we don't spend our days "spying" on cheating spouses and wayward children. (However, we do have experts on our staff that do those assignments.) We are not usually performing crime scene investigations or solving the unsolved crimes of the world. When the criminal cases come to us, they have already been "solved" by a local law enforcement agency, an arrest has been made and charges filed. We then investigate the "closed case." So what do we do at CLI? How did we get started? It's not TV material (although Mark occasionally wears a Hawaiian shirt). It's not a movie in the making with intricate plots and vehicle crashes involving expensive automobiles. The worst crash we've had is when Wendy's Honda was sideswiped while she was parallel parking in front of the courthouse. It's about a married couple, with a great deal of legal experience, who had a dream of being self-employed and working together. Mark started his career in the US Air Force. He was trained as a Russian translator monitoring Soviet air traffic. (This could be a movie plot.) After the military, Mark took a job repossessing cars while attending the University of Nebraska at Omaha. Yes, Mark was a repo man. After graduation, he moved his family back to his hometown of West Palm Beach, and began his career as an investigator, working for Equifax as a claims specialist. He then worked as a staff investigator for the State Public Defender's Office; for the Hon. Nelson Bailey (when Nelson was in private practice); and then in 1993, he joined the Federal Public Defender's Office as a staff investigator. There, he worked with some very fine attorneys and investigated a great number of complex white collar criminal cases. After eight years with the Federal PD's office, Mark decided he wanted to make the move and open his own investigative agency. That required a great deal of business and financial planning, which included �brown bagging� his lunch for a while. He rented an office from a local investigator. The day he gave his notice to the PD's Office, they offered him a raise and a transfer to Miami. It was tempting, but he followed his dream, and the Great Southern Detective Agency was birthed on October 1, 2001. Yes, right after 9/11, when there was a great deal of uncertainty and the world changed forever. Mark kept the agency rolling, while Wendy worked as an assistant to Attorney Bob Montgomery. Mark worked lots of �court appointed� criminal matters for some wonderful attorneys, who entrusted him with their cases. For this, we will always be grateful. In 2003, Wendy took the leap of faith and joined Mark at the agency. After 16 years at her current position, it was a hard decision, but Mark needed her help and she was ready to jump on board. 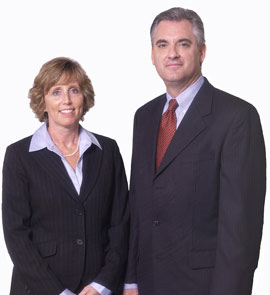 Wendy had already obtained her PI license, so Mark found another office to lease, and they were off and running. Actually, it was more like walking at a slow and steady pace, with moments of just "limping along." Some of our most memorable early times were sitting in hot cars in Jupiter or in hotel lobbies in Miami Beach, watching for a wayward couple. However, we eventually decided this was not our gift and to let our expert surveillance teams handle this for us. In 2007, we changed our name to Complete Legal Investigations to better represent to our clients what our company truly provides. We also started pursuing the civil area of law, particularly plaintiff personal injury. We have had the privilege of working with some of the finest attorneys in the profession. They have made us better investigators. Our job is gathering information, not just easy-to-find data, but to dig deeper, putting the whole puzzle together. Every piece of information helps complete the picture -- whether it's the events and people involved, the veracity of the police reports, or the social background of a person facing the death penalty. We spend the majority of our time talking to people and doing �due diligence� research. We study people --what they saw and what they did. After 13 years, we are still working together, being challenged, and growing and learning something new every day. Our clients raise the bar and we try to meet their needs at the highest level. It�s our story, and your story, our puzzle, and your puzzle, to which we add another piece with each case we investigate on your behalf.